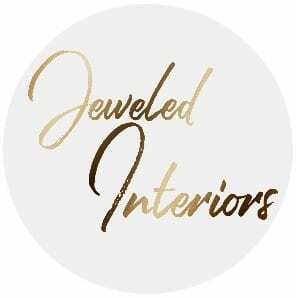 Welcome to Jeweled Interiors, an interior design blog focused on eclecticly chic interiors decorated with a hint of romance and drama (via a heavy dose of creative gumption). I’d like to give a special greetings, big hugs, and high fives to anyone joining me from Casawatkinsliving.com. Stephanie has been so kind as to let me participate in MY VERY FIRST Christmas Tree Hop. As you may already know, this event was created to expose readers to a variety of styles and bloggers. If you have “hopped” here from PMQfortwo.com then you surely loved Ariel’s colorful and lively addition to the Christmas tree collaboration event. Like Ariel, we are a military family accustomed to the challenges of constant moves and often less than glamorous housing. Luckily for me, however, we are four months into a 10 month rental (yep you read that right- only a 10 month lease) of a lovely New England home. My style is a reflection of what I have learned and experienced over our 11 moves. One of the more glamorous assignments was a two year stint in the UK. It was here that I learned to buy, rehab, and resell furniture at the British auctions. It is also during this hop across the pond that I learned to appreciate most all eras of design, and ever since then I have refused to stick to just one. Don’t worry though! There are a few reoccurring themes that define my style…Ready? Romantic + Eclectic + Chic (oh, and throw in a hint of unexpected drama when possible)…Wait…did you already read the title of this post? 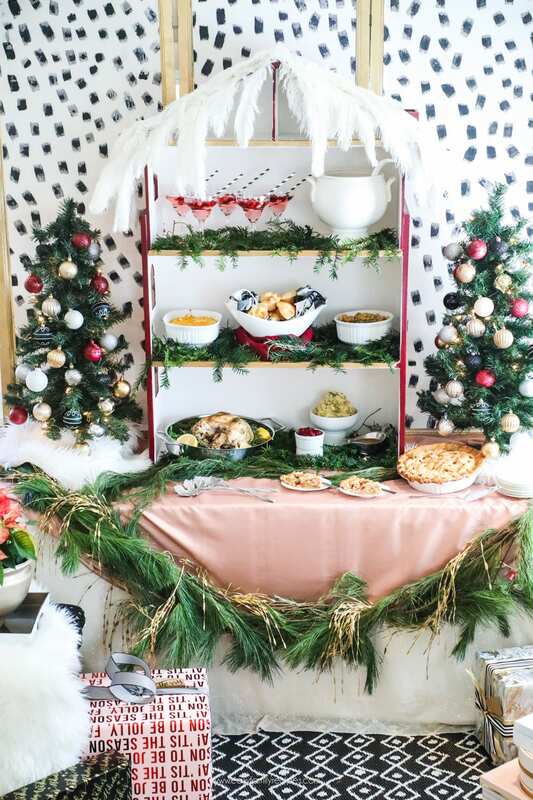 Here was my inspiration for my holiday decor this year. Yep, looks a lot like my ONE ROOM CHALLENGE, doesn’t it? I love when my tree pings off of the colors in my room. 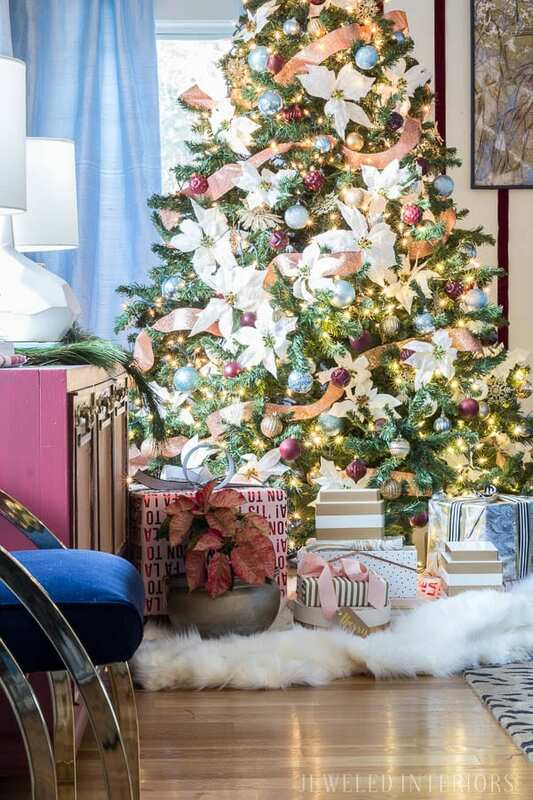 After adding billowing diagonal blush ribbon, a smattering of faux white poinsettas, and a bin full of room coordinating ornaments my Christmas tree was starting to come together. Notice the two pics below though. 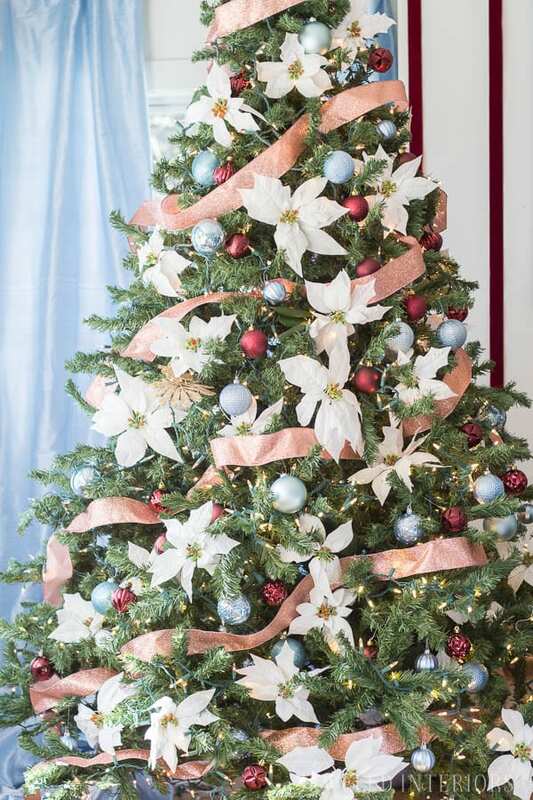 It is the last two steps that took this tree into the dramatic and romantic realm… Can you guess what it is? 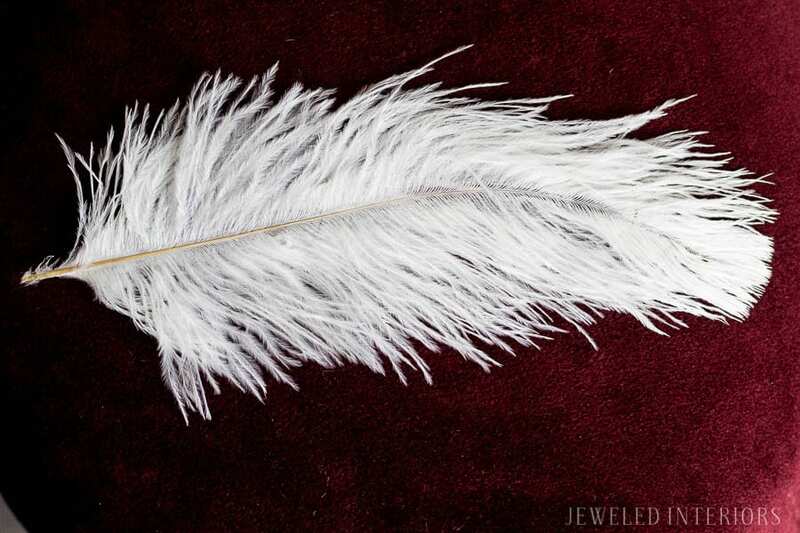 If you “buzzed-in” ostrich feathers then you are today’s lucky winner! Yep, ostrich feathers. I splurged on these majestically white beauties a few years ago and use them as often as possible. 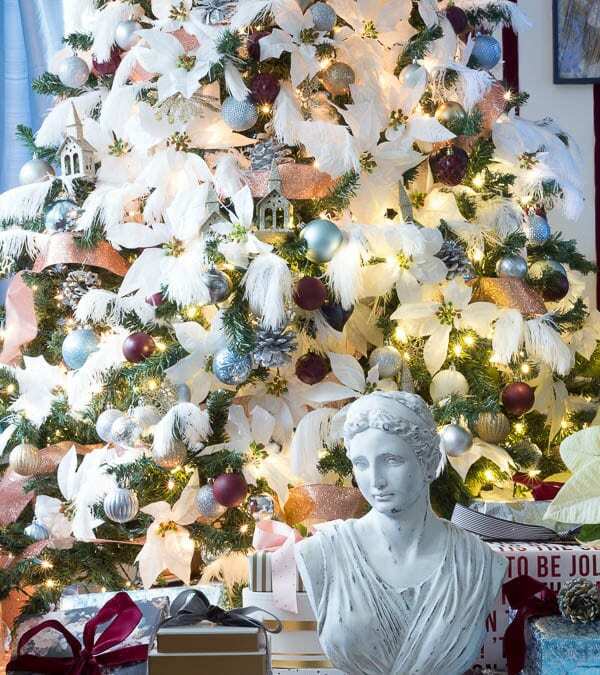 Check out last year’s Nature-chic Christmas HERE. 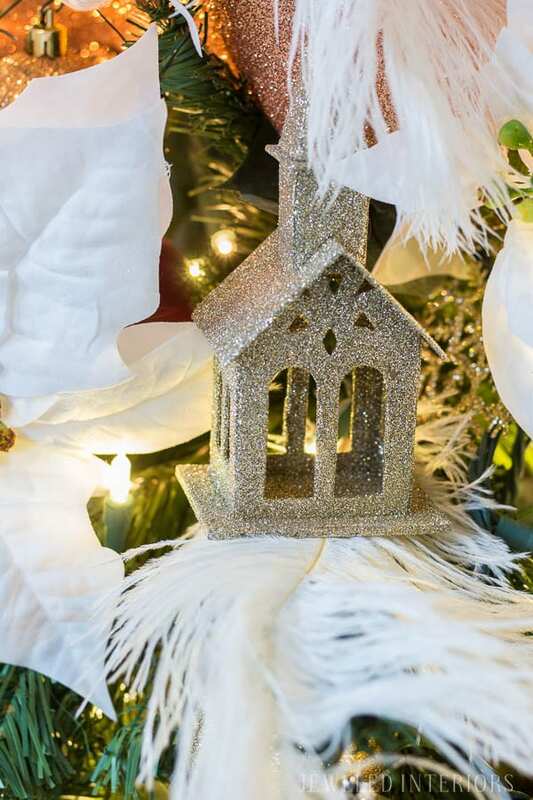 Also, I added Christmas house ornaments from Hobby Lobby to help tie my two main trees together and to coordinate with a HOLIDAY PARTY I just threw. While I technically put up 5 trees this year, my second favorite tree resides in our kitchen. For more details on how and why I came up with the dalmatian print ribbon (plus a lot more pretty pics) CLICK HERE. 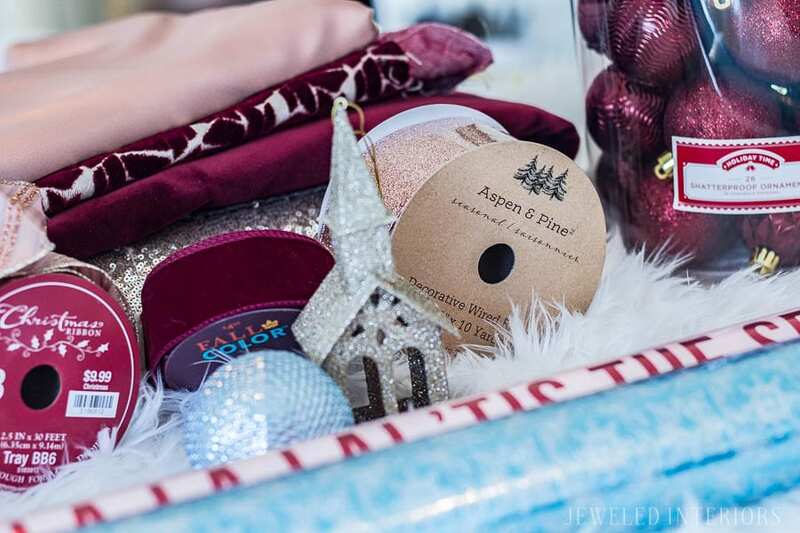 Want more Christmas party fun, Jeweledinteriors style? 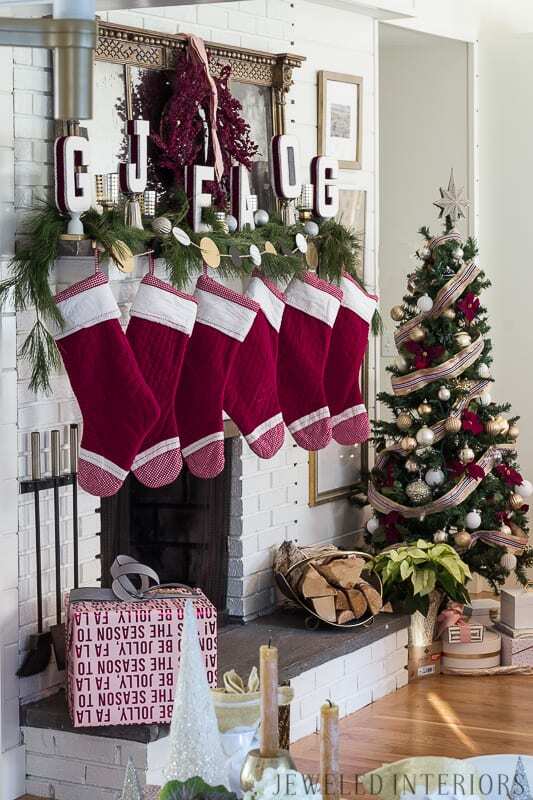 Click HERE for part 1 of my holiday home tour. 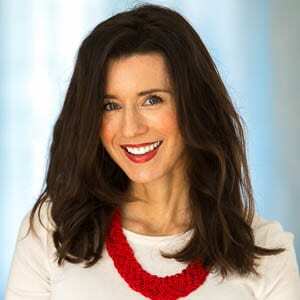 Now, it is my absolute pleasure to introduce the next blogger in the Tree Hop…THE ONE…THE ONLY…BRYNNE D from thegatheredhome.com. I have to tell you that Brynne is my new virtual pen pal and friend. By all accounts she is every bit as kind and gracious as she sounds on her blog. I value her advice, style, and friendship. 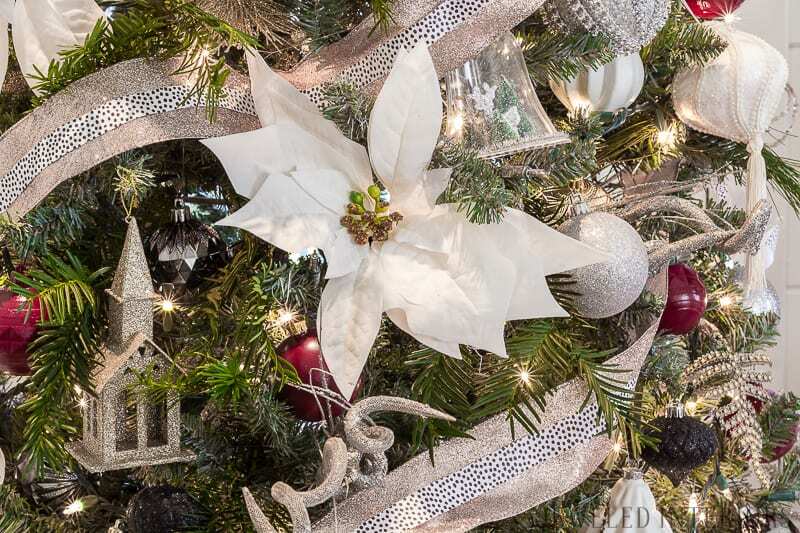 I can’t wait to see what magic she has worked up on her tree this year… TAKE IT AWAY BRYNNE! 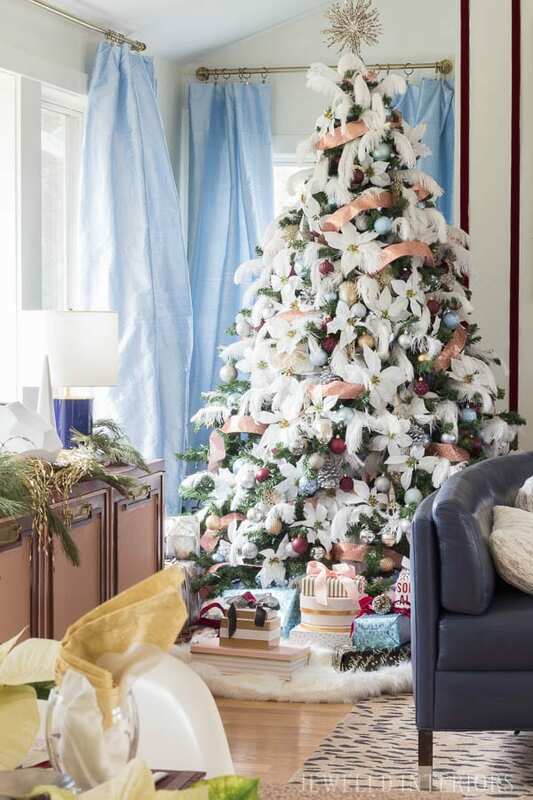 So very elegant and I especially like how the light blue ornaments tie in with your decor. It’s such a subtle touch of contrast that really pulls everything together. Love the addition of those feathers!! Beautiful. Thanks Jessica! 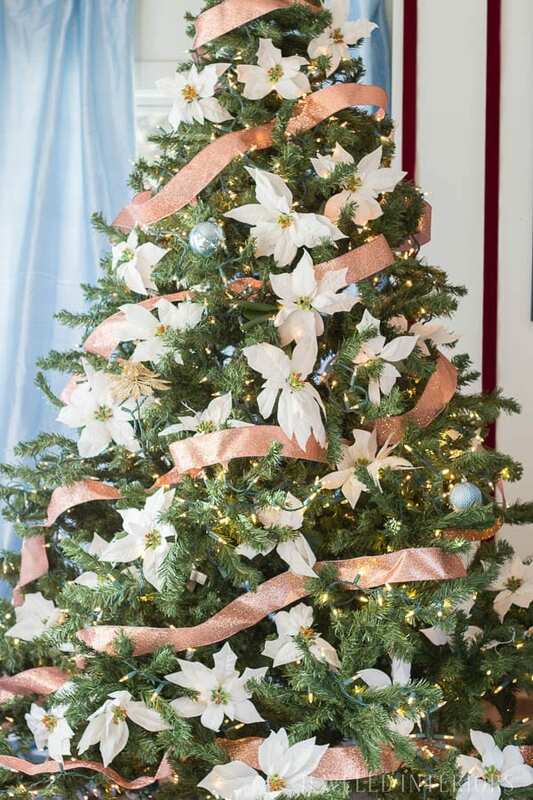 Your tree was amazing! Thanks Lora- I loved the magnolia blooms on your tree! Wow! 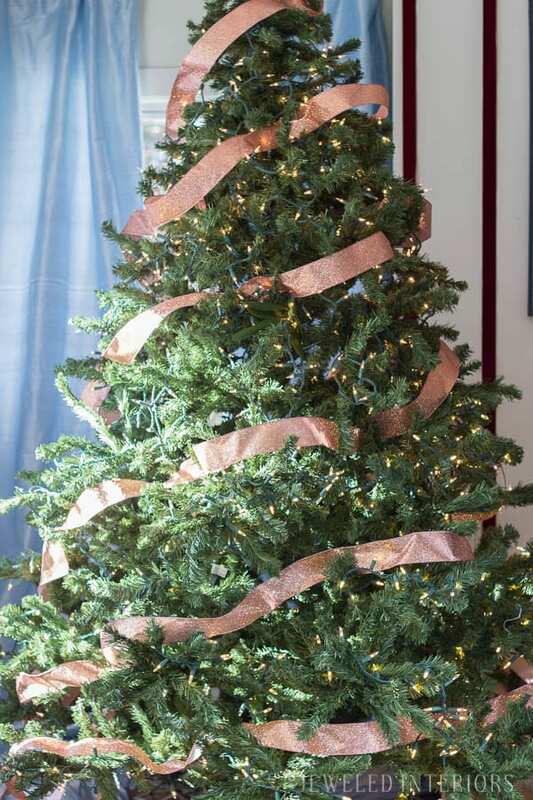 Your home looks lovely and your tree is just stunning! 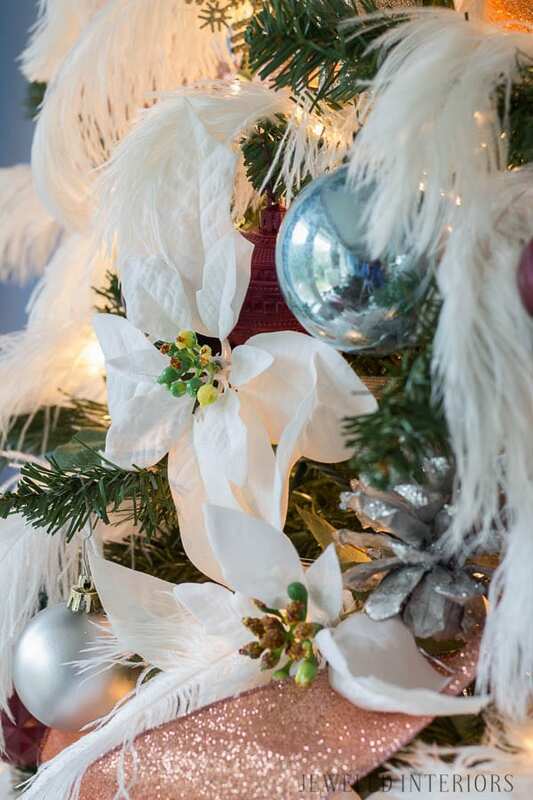 The feathers are an amazing addition to your beautiful tree! The little pops of violet perfectly contrast the lighter color palette too. Thanks Cindy! Your farmhouse tree is darling! Thanks Leslie! 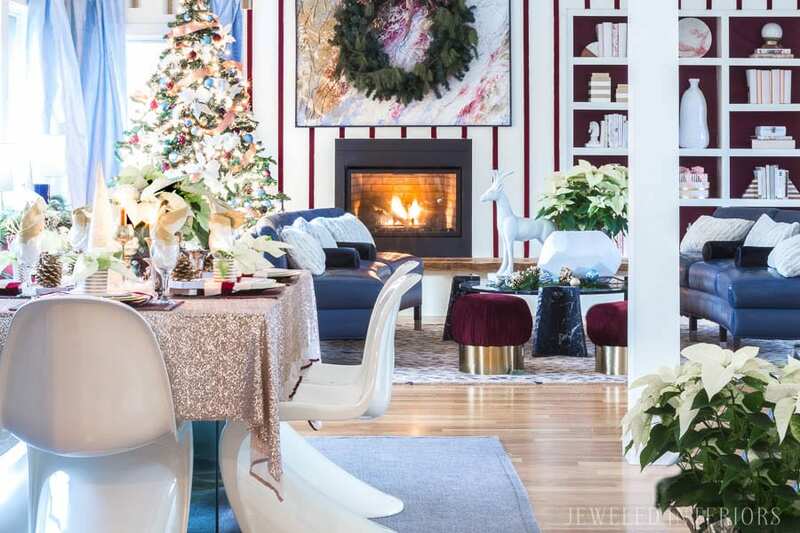 I love your mantle, tree, and the color of your dining room! Nice work! I’m so glad you joined the hop this year Jewel! I love meeting other fellow military spouses (and overseas!). Your style is impeccable and your little model did such a lovely job. Thanks for sharing your trees with us! Merry Christmas! Oops, not overseas but still very nice to “meet you.” What branch is your hubby? Thanks so much Kathy! It has been a blast to participate. I sincerely love the way that your style has so much character and “patina”. I adore that you let the story of your furniture and accessories speak for themselves. Very pretty! Not overseas but military for certain (AF). So I hear ya on making the best of whatever our current housing situation may be! 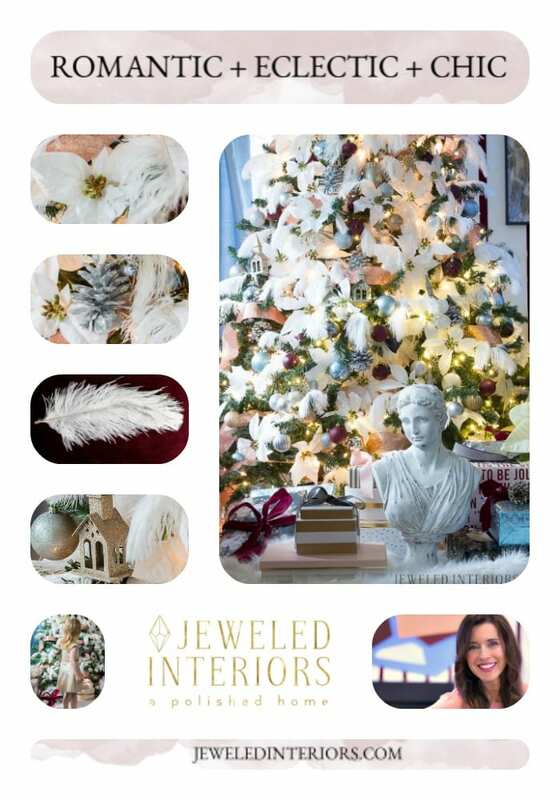 I’m absolutely dying over your tree, Jewel! 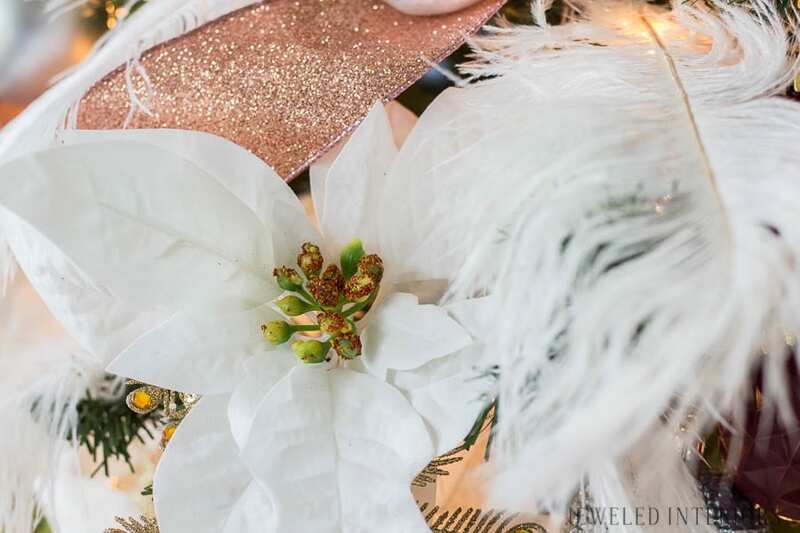 Those ostrich feathers are INCREDIBLE and I love love LOVE that you shared those step by step decorating shots! Gorgeous!!! Thanks Brynne! The feathers are admittedly my favorite part too. It was worth the investment because you know I will be using them every year for the rest of my life :). 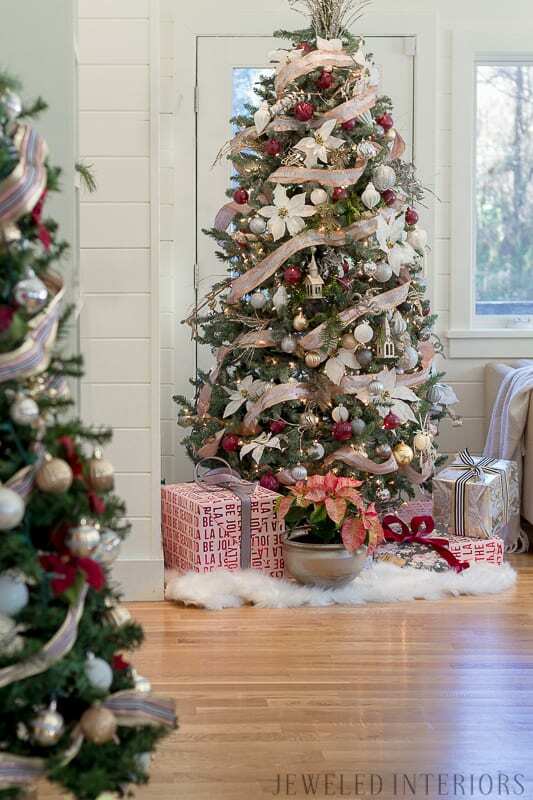 You home looks so beautiful for the holidays as well! Thanks for stopping by! Jewel!!! 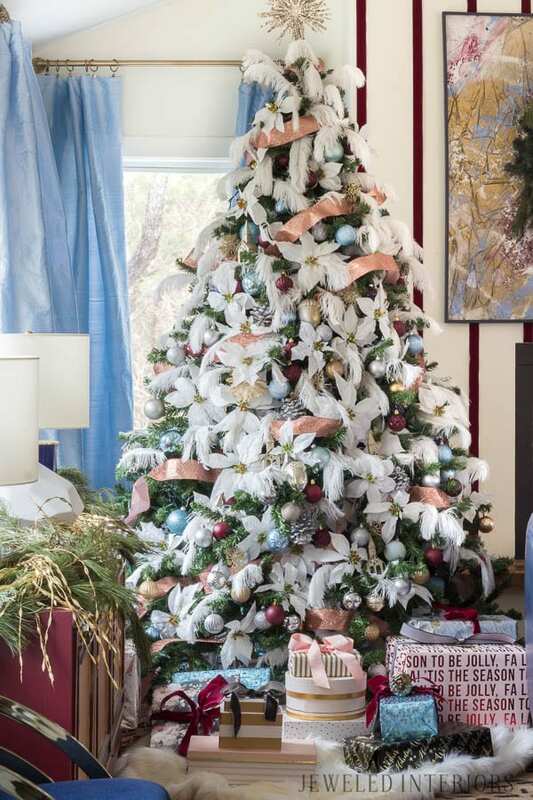 I’m blown away by your Christmas tree styling. 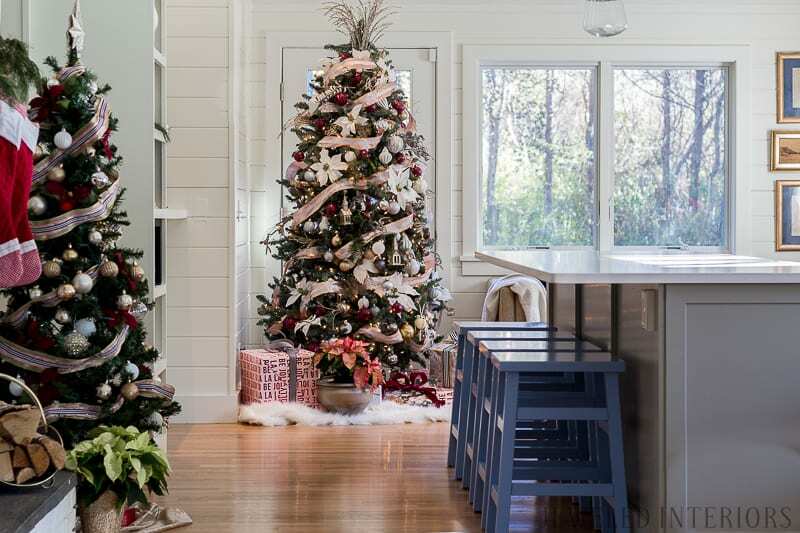 Your home is amazing and the way you incorporate your tree styling into the entire color theme of your Christmas decor is superb! 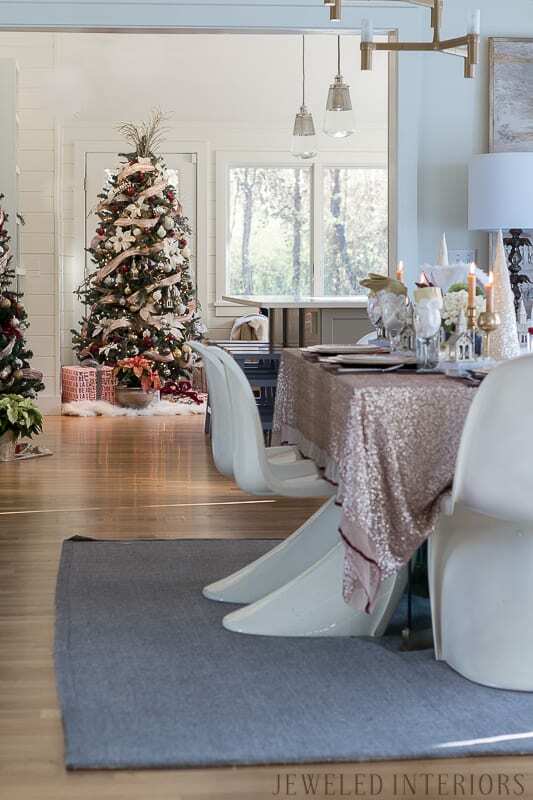 Gorgeous styling and beautiful decorating. Thanks Stephanie! 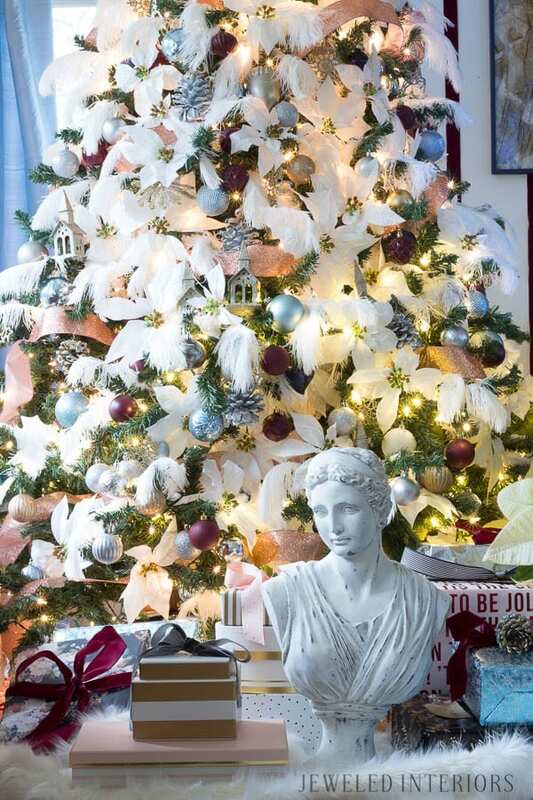 I adore the your tree (and well, the entire room really). Thanks for letting me participate in your Blog Hop! I seriously had so much fun! Totally digging your style! It looks like it’s right up my alley. That tree is fantastic too. Well done! Thanks girl! I have actually been thinking a lot about your decor lately. I love how you effortlessly mix colors, yet keep it looking sophisticated. As I contemplate where I want to go with my next room I have images of your style tempting me :). Thanks for bopping’ on over to my blog. Merry Christmas. 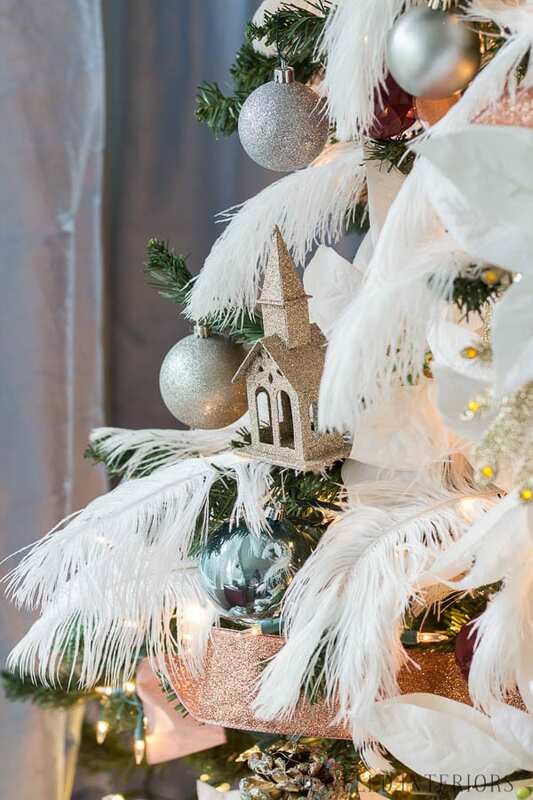 Love the drama those ostrich feathers add–beautiful tree!